Life in the wild isn’t for the faint-hearted. It is survival of the fittest, and the lucky. For bison the story is no different. 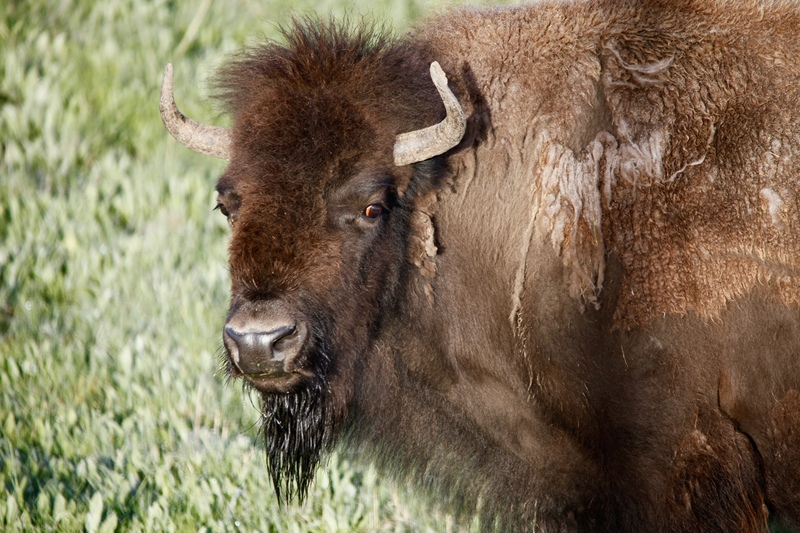 Life for baby bison begins during the mating season from late July to early August. During the rut, males compete for the privilege of mating with females. Bulls tend cows hoping to win their affection while charging at other bulls, asserting dominance. At times two well-matched bulls will escalate, running and colliding in a fury of horns, dust and testosterone. Occasionally males die in the fights, some without the previous opportunity to pass their genes on—an end, from the evolutionary perspective, just as unfortunate as that of the famous calf—but they die unnoticed in the natural sequence of things. 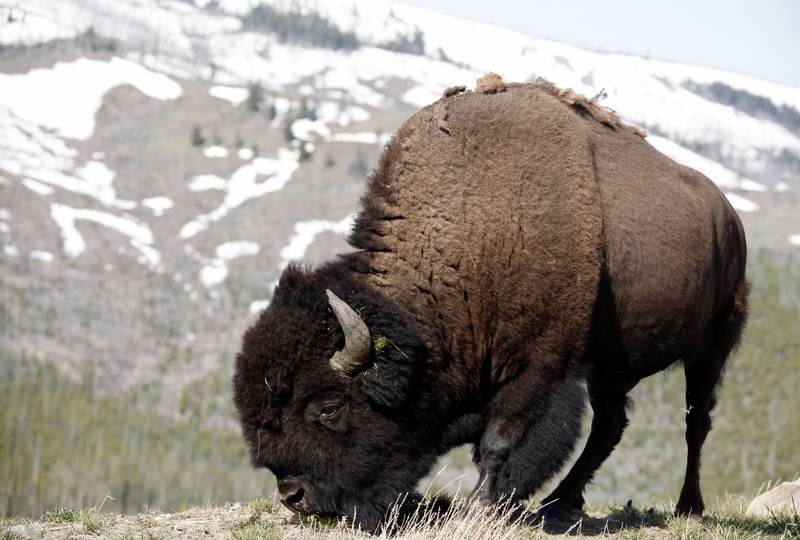 Female bison spend the next nine and a half months through the fall and the harshness of winter trying to find enough food for themselves and their growing fetus. Thick blizzards turn the land into a sea of white: winds howl through the trees and whip against the bison’s winter coat, so thick snow settles on it without melting—an adaptation to withstand temperatures that plummet well below zero. In low snow years foraging is easier; other years heavy snows bury the limited food supply so deep bison struggle to uncover it. Those who are older, weaker, or thinner coming into the winter may not have the reserves to withstand the pressures and so wither. The end may come from a fatal display of weakness in an encounter with a hungry predator or simply a final succumbing to the elements. Even the young and healthy may take unlucky falls into icy water and freeze to death. Every year winter claims part of the herd, most often it is the very old and very young who don’t make it, but every year baby bison die before they are born. Predators and scavengers encounter weak and recently deceased animals, and upon their flesh, delight in the fortune of food. This meal may tip their own life and death balance. Some animals die and are quickly buried in snow, held by winter in an embrace of cold. Intact, the body will wait until spring, when it shall give way to thaw and hungry scavengers. One life force passes into another; the lost for the living. And so winter fades and life, as we generally think of it, begins for most bison between late April and early May during the greenup as snows melt and food is plentiful. Mothers give birth in short succession, a technique that swarms predators and increases young survival. Within the first hour, a newborn calf will set its delicate hoofs upon the earth and push its full forty to fifty pounds onto delicately crafted legs. Soon after the calf will be able to follow its mother. As with so many parents who care for their young, the mother and baby will learn each other’s scent, the rhythm of each other’s voice, form one of natures greatest bonds. The young relies on its mother to survive, and she pours her energy into her offspring in a primal drive to pass her genes into the future. In their first months of life calves, sometimes referred to as ‘red dogs’ for the rusted hue in their natal fur, stick close by their moms in large “cow” herds made up of cows, calves and some immature bulls. Spring calves seem to find their feet with great enjoyment—running in erratic spurts, leaping into the air, snorting. They interact with each other, nuzzle their mothers, nurse, grow, nurse, grow, and begin learning how to forage on grasses, sedges and forbs by watching what the herd is eating. Staying close to mom and the herd is important since emerging hungry grizzlies and other predators are constantly looking for the easiest meal. I spent an afternoon watching month old youngers suckle greedily from any position they could reach a teat. The mothers mostly grazed, slowly stepping on to better forage, the calves stumbling along attempting to stay attached. One particularly chubby little one alternated between nursing and head-butting its mother’s udder. It pulled steadily at a teat, its head moving up and down rhythmically as it drank. Perhaps the milk flow slowed: the calf let go and rammed the top of its head into the udder with such force the mother’s whole body shifted and she had to regain balanced footing. The calf’s dark velvety lips found a teat again and suckled furiously. The patient mother occasionally swung her enormous head around and looked at her offspring with what I took to be an astonished eye. Once or twice she stomped her back leg in annoyance. The calf took no notice of her irritation, fully absorbed in alternating between teats and head butting the udder when he needed. 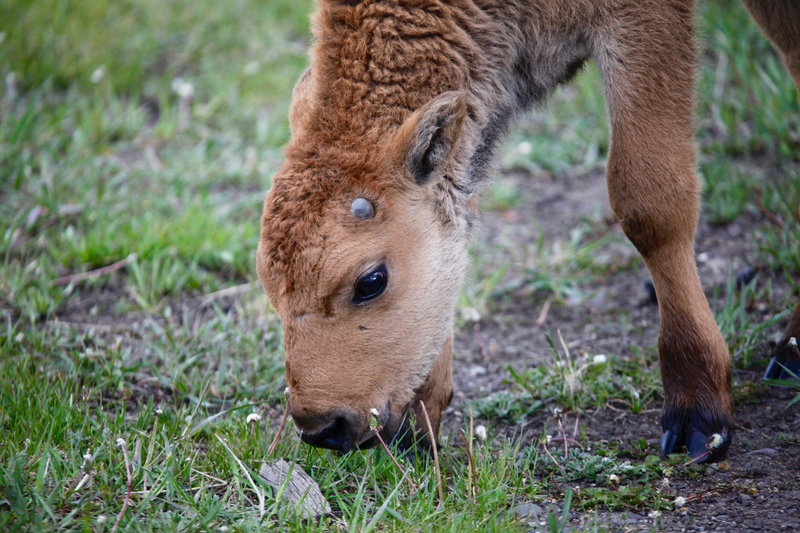 A baby bison sniffs at a stick, just a daily part of figuring out the world. 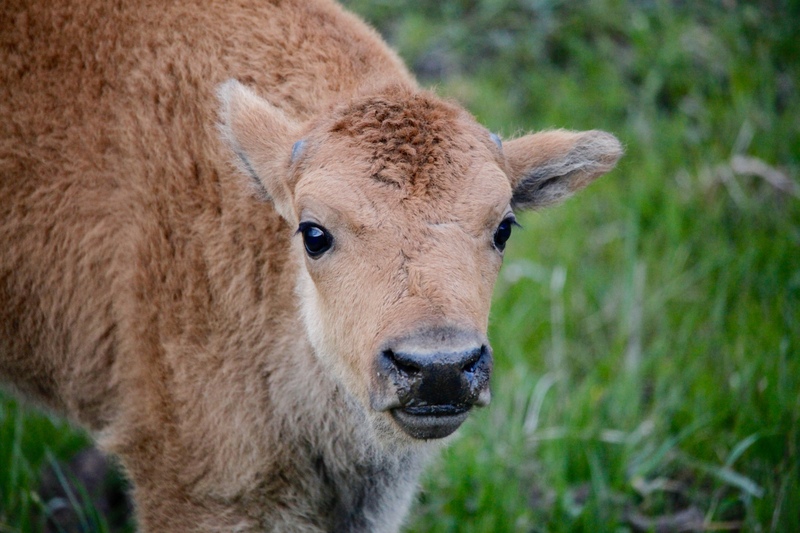 But life for all young bison is not a happy revel in new limbs, friends and endless milk. Cows may die in childbirth, leaving a newborn instantly motherless. Perhaps even more difficult for humans to accept, is the fate of a calf born to an apathetic young mother who refuses to play the part. 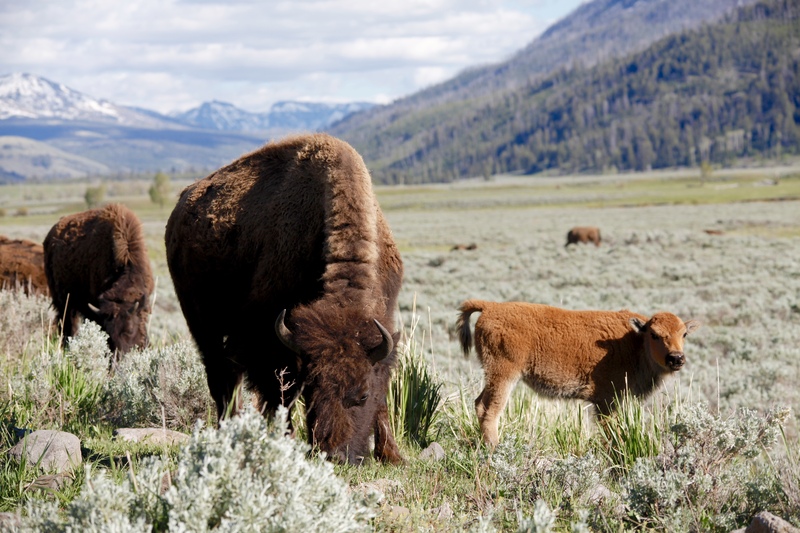 Bison graze and move constantly, in times forging large rivers swollen with spring runoff that can sweep a young calf far down river separating it from its mother, or drown it. Amongst the thundering hooves of a stampede to avoid predators, calves can become separated. A great number of obstacles await the young in the wild. If anything is to separate a mother and calf, the prospects for the youngster are bleak as cows do not adopt the young of other cows and so the abandoned calf will hopelessly wander until it perishes. Individually tragic. A sad story, the type humans have a hard time stomaching. The type people go to great lengths to make happy. But it is the way of the wild and not a sad story for bison, because many more will live to raise their own young, than die. Natural selection is not a benevolent shaper of living things. Evolutionary history is one of death—and of perseverance. Ecology is a fine balance between climate, plant communities, herbivores and those that eat them. The circle of life continues as energy passes from one organism to the next. 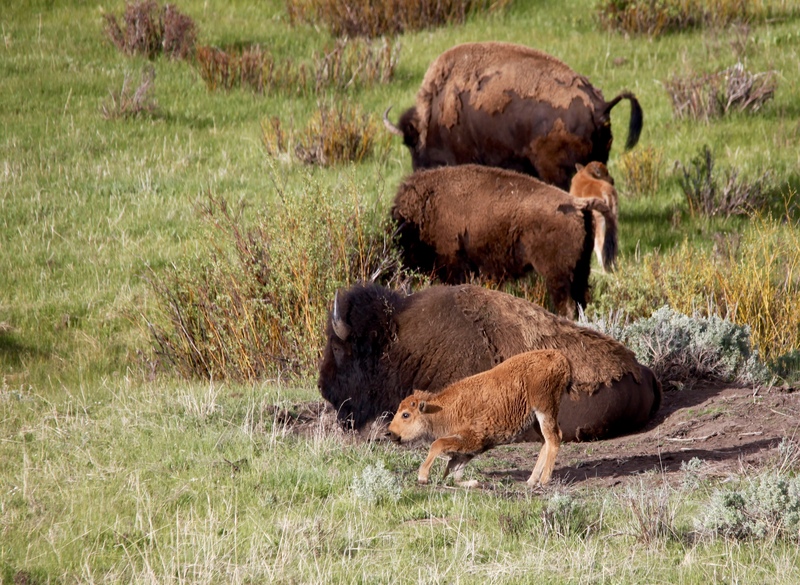 Dead calves feed black and grizzly bears, wolves, coyotes, raptors, beetles, a host of other species, in time even trees, and new grasses and sedges to feed more bison. Wild places need to be wild. There are only a handful of intact ecosystems left on our planet. Human interference cuts habitat and threatens entire species. There are the cases in which wildlife experts must intervene because the life of an individual is important for the wellbeing of the entire population or species, but those are difficult decisions that only can be made by experts. For the wildlife enthusiast going into what is left of wilderness, we must remember that we are guests in a complicated system. It is not our place to intervene nor will our intervention help. The interconnectedness of an ecosystem eludes the untrained eye; relationships between organisms are so intertwined scientists are still uncovering novel links. When given the chance to be in wild places it is our privilege to observe, leave light footprints and allow life to take its course, as nature would have it. The ecosystem will benefit, even if the individual may not. This view may seem callous; the human psyche is grounded in individuals and community not in the bird’s eye view of population dynamics. Most people find it very difficult to watch another being suffer and not intervene, try to assist, do something. Such caring is one of the great virtues of human kind. The father and son who tried to save the calf thought they were doing the right thing. They were showing mercy on an abandoned baby, staggering about, warming itself by car engines, its umbilical cord still attached. I understand their empathy and desire to help this little one. But I also know that calf was not destined to live long upon this earth. Its early demise was likely inevitable, something the media failed to acknowledge. And as an ecologist, I know the best thing humans can do for nature as a whole is leave wild places undeveloped, and leave wildlife alone. Death plays an important role in all ecosystems. Each creature is part of an intricate web, delicately balanced and supported by the passing of energy from one organism to the next. The life force of a shivering bison calf will pass into a soaring raven and a playful wolf puppy, and who are we to stop it? Informative essay, and the video is a wonderful laugh!! I am blown away. A wonderful piece. Thanks Susan, I really appreciate it!